Last year, I wrote a grinch-like article saying I don’t think the Star of Bethlehem is anything more than a legend. I still think that’s likely to be the case, but there’s more to talk about on the topic now: an astronomer in Australia thinks he’s found the actual Star. It wasn’t a star, he says, but an incredibly close conjunction of the planets Venus and Jupiter. If you saw the very close pass of the two planets on December 1, 2008, then you know how striking it was. What astronomer Dave Reneke found was that in 2 BC, Venus and Jupiter were so close together they would have appeared almost as a single object. That would have been quite spectacular, especially over the few days leading up to the event as the two planets crept closer in the sky. If he’s right, then it wouldn’t surprise me at all that this event would have caught everyone’s attention 2000 years ago, especially since they were more attuned to the night sky than we are today. Australian astronomer Dave Reneke used complex computer software to chart the exact positions of all celestial bodies and map the night sky as it would have appeared over the Holy Land more than 2,000 years ago. 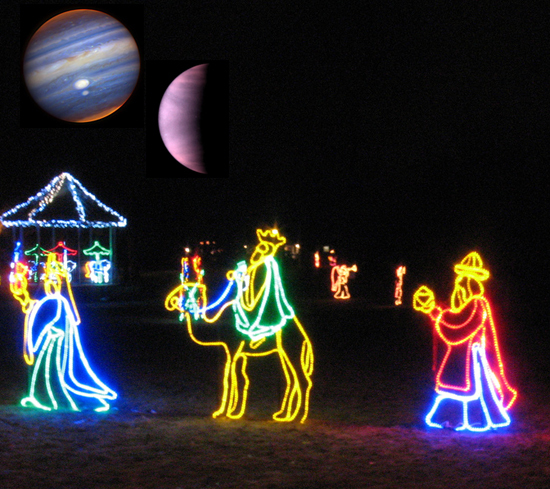 It revealed a spectacular astronomical event around the time of Jesus’s birth. Mr Reneke says the wise men probably interpreted it as the sign they had been waiting for, and they followed the ‘star’ to Christ’s birthplace in a stable in Bethlehem, as described in the Bible. My problem with this is the leap of logic from The Star being a real event to it actually signaling the birth of Jesus. Basically, if this is being reported correctly, he is still relying on the account in the Bible being literal. There’s still no indication of this; the conjunction could have been real, but that does not mean it had anything to do with Jesus’ birth. As we know, people see signs all the time, and will conflate two different events given the chance. There’s no indication anywhere outside the Bible story that the Wise Men really existed, or made their journey, or saw The Star. We also know that the Bible has been re-interpreted, re-written, and retranslated many times over the years, so it seems very likely to me that the Wise Men story is just that: a story, and the conjunction gives it a nice ring. I’m not saying any of this didn’t happen. I am saying that we still have no proof, but the article states all this as a matter of fact. This is not an attempt to decry religion. It’s really backing it up as it shows there really was a bright object appearing in the East at the right time. I disagree; it’s not backing up religion, it’s giving evidence that one part of a Bible story may actually have occurred. Anything else is speculation. The article goes even further, saying that this means Jesus was born in June (when the conjunction occurred), not December. Again, this is stated as fact without any real evidence linking the event to the birth of Jesus. The thing is, the reason Christmas is celebrated in December is not clear. There’s nothing in the Bible indicating the actual date (and some evidence in the Bible against it being in December; the Bible says shepherds were tending their sheep at night, which was unlikely during the winter). There are lots of theories, including early Christians usurping a pagan holiday (there is evidence for and against that idea; but decorating trees, for example, didn’t start until centuries later) that occurred at the winter solstice. So it’s certainly possible that Jesus was not born in December, but it’s still a pretty big assumption that this conjunction was tied to the actual date of the birth of Jesus. Having said all that, I will admit to an error on my part. In my other article on this (linked above), I made a point about not being able to follow a star in the sky for any length of time because stars rise and set. However, for a conjunction of Venus and Jupiter to be easily seen, it has to happen near the eastern or western horizon; Venus never gets far from the Sun, so you can only easily see it after sunset (in the west) or before sunrise (in the east). So if the Wise Men story is true, and they saw the conjunction before sunrise in the east, then they could "follow" it, knowing they had to travel east. During the day they couldn’t see it, but they would have known that was the right direction to go. Still and all, I think this is a solution looking for a problem. Like a lot of other Bible stories, I think this is a pretty tale that has some basis in reality, but is probably not true in detail (like Noah’s Ark, Job’s travails, Sodom and Gomorrah, and so on). The astronomical evidence is interesting, but interpreting it should be done with a pillar grain of salt. Image of the Three Wise Men decorations courtesy jbcurio’s Flickr stream.